William Clinton's Inaugural Address concentrated upon the theme of renewal. He offered his first inaugural address to the nation on January 20th, 1993. In that speech, Clinton concentrated upon the theme of renewal. “By the words we speak and the faces we show the world, we force the spring. A spring reborn in the world’s oldest democracy”. By concentrating on the United States’ status as the first contemporary democracy, Clinton identified the nation’s special status as a world leader. As Clinton discussed major issues that he planned to address during his Presidency, including the world AIDs epidemic, the status of the environment and the global arms race, Clinton concentrated his words upon driving changes that would reinvigorate and strengthen the United States. He contended that there were no more domestic or foreign issues and that all issues had both a local and an international component. 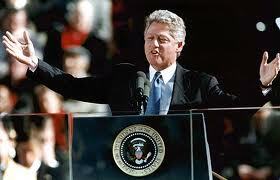 William Clinton gave his second inaugural address on January 20th, 1997. Within this speech, Clinton reemphasized the themes of his first inaugural address. Clinton looked ahead to the new century and declared that there was a need for a new approach and a new government to face the new challenges. He emphasized the importance of technological development as a mechanism for helping the United States and its population to achieve their potential. Republican Party Research Papers discuss the history of this party along with the republican party today and how it has differed from the past. Democratic Party research papers discuss one of the two major political parties in the United States that represents the liberal side of the political debate. George Washington was responsible for offering the nation's first inaugural address. Jimmy Carter's Inaugural Address research papers are custom written by Paper Masters. Inaugural Address of Martin Van Buren research papers discuss key points of his address. Paper Masters research papers are tailored to your requirements. Thomas Jefferson research papers discuss how he delivered his first inaugural address on March 4, 1801. Inaugural Address of James Polk research papers are custom written by Paper Masters. Inaugural Address of Andrew Jackson research papers discuss the tone of Andrew Jackson's inaugural speech and how it refers constantly to the US. Inaugural Address of Ronald Reagan research papers are custom written by Paper Masters. The Inaugural Address of George W. Bush at 12:01 p.m., Jan. 20, 2001, Chief Justice of the United States William Rehnquist conducted the swearing-in. John Quincy Adams Becomes President research papers are custom written by Paper Masters. We do your research and writing on the second U.S. President. Al Gore research papers examine the 45th Vice President of the United States who served under President Bill Clinton. George Bush research papers on the 43rd president who came into office in January 2001. Jefferson Davis research papers discuss the President of the Confederate States of America, the collection of states that seceded from the United States. William Howard Taft (1857-1930) was the only man to serve as both President of the United States and Chief Justice of the Supreme Court. Theodore Roosevelt Research Papers explore the life of this man as a child and as the President of the United States. Jimmy Carter Research Papers account for his time as President of the United States. Carter was also known for his public speaking skills. James K. Polk research papers discuss the accomplishments of the 11th President of the United States. Herbert Hoover research papers discuss Herbert Hoover's life and how he got into politics and then became president of the United States. Paper Masters writes custom research papers on William Clinton's Inaugural Address.